I thought I would take today to post the cards I have in my collection from the 1949 Bowman Series. It's been a while since I did a posting in which I include a checklist of cards from the given year. 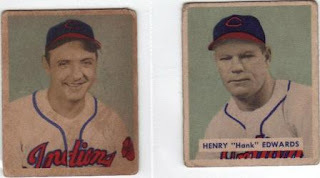 The two cards I have of this set are Sam Zoldak and Henry Edwards. I don't know why, but the Zoldak card features no player name on the front and the name on the back is typed out. The Edwards card has the player's name on the front in a white box, and his name on the back is in a cursive style. For 15 cents, and 3 wrappers, one could send off for the "Official Baseball Ring" which was "Made of durable metal. Adjustable - fits any size finger..." The baseball in the middle of the ring was white plastic and there was a crossed bat relief on either side of the ring. Unfortunately for us, the offer expired on December 31, 1949. A Major Award! It's Italian! "Fra-Jeelee!" I won!! Holy Smokes, I won!